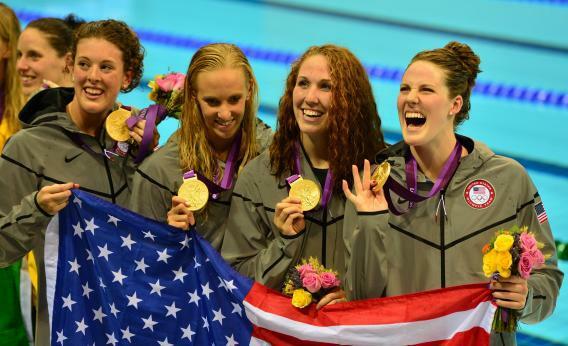 Allison Schmitt, Missy Franklin: How did America’s swimming stars get so gosh-darned nice? How Did American Swimming Stars Allison Schmitt and Missy Franklin Get So Gosh-Darned Nice? Allison Schmitt (left), Missy Franklin (right), and their teammates celebrate after winning gold in 4-by-200 freestyle relay. Watching Allison Schmitt give a post-race interview is like drinking a milkshake made of sunshine. She’s so happy—breathlessly happy, and exhausted, and excited—to win her first gold medal in the 200-meter freestyle. “You’re known as someone who is so loose and such a jokester,” says NBC’s Andrea Kremer. “We were singing songs … Michael [Phelps] and I were joking around,” admits the 22-year-old champion. Schmitt is like this all the time. Watch this interview from the USA Swimming Grand Prix in Indianapolis, during which a victorious Schmitt brims with praise for her competitors, mentioning each one by name. Asked about an earlier bout of sickness, she beams and assures the camera, “I’m definitely feeling better.” The virus probably degraded in remorse. Schmitt’s friend, 17-year-old charmball Missy Franklin, has been equally appealing in her pool-side chats. After her American team won the 4-by-200 freestyle relay on Wednesday, she revealed in the post-victory interview that “our coach called us the smiley group before we came to the venue, but I think it’s definitely true.” And then she giggled! This interview from the Austin Grand Prix is also delightfully chipper. “I love swimming back-to-back events,” she chirps. Even talking about “her worst enemy,” the 50 free, her face is wreathed in smiles. Articles about Schmitt mention her “ready laugh” and “bubbly” demeanor. Franklin, who will swim in seven total events this Olympics, “comes on all bubbles and dimples,” according to the Washington Post. Another WaPo column praised her sunny, easy approach to sports—the product, it argued, of parenting done right. Whether they were born and raised that way, or whether they’re both just unusually socially adept, Schmitt and Franklin occupy a sweet spot that ambitious women will recognize. It’s that holy-grail space where you are nice and lovable and unthreatening until you have to be something else. Then you turn into a formidable force—and are celebrated, rather than penalized, for it. These effervescent women become furies in the water, yet they’re media darlings because they compartmentalize their competitiveness so well. Schmitt was asked on Tuesday how she kept her concentration amid the excitement of the Olympics. “As soon as we step on the block, it’s time to focus and get ready for the next four laps, I guess,” the 22-year-old replied. That’s a pleasantly self-effacing way to put it, but it doesn’t seem like Schmitt or Franklin do a lot of guessing in the pool.